Available from Castlegate James , Brewers Grains is a moist co-product produced from the malt brewing industry. During the malt brewing process, malt sugars are extracted and separated from the malt barley, producing a high value stockfeed known as Brewers Grain. 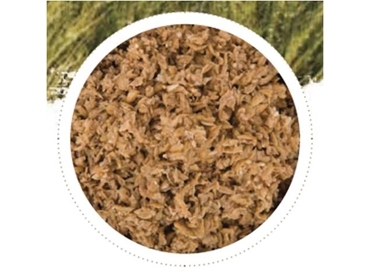 This grain is a high energy and high protein moist supplement that contains high levels of digestible fibre, small particle size and high levels of bypass protein. The energy in Brewers Grain stockfeed is primarily derived from the high levels of small particle digestible fibre, with further energy from the high 10%-11% oil content. The small fibre particle size of Brewers Grain assists milk fat production while enabling a high dry matter intake (DMI). Over 80% of the Brewers Grain particles are able to pass through the rumen relatively quickly and still contribute towards rumen fibre digestion and milk fat production. Furthermore, the high percentage of small particles within Brewers Grain stockfeed pass through the rumen fast, encouraging a greater DMI due to reduced rumen fill. Despite this high concentration of small particles, Brewers Grain has twice the physical effective fibre of milled grain and therefore stimulates greater chewing and saliva production to buffer the rumen, promoting an optimal environment for fibre fermentation. Due to slow degradation of protein within the rumen, Brewers Grain stockfeed also supplies high levels of rumen degradable protein or bypass protein, which is beneficial for maintaining high levels of milk production. Brewers Grain stockfeed is suitable for supplementary feeding or as an ingredient in total mixed rations for dairy and beef cattle. It is available on a long term and regular basis for those clients wishing to secure an ongoing supply, and supplies of Brewers Grain stockfeed may be contracted or purchased on a spot basis subject to availability.